Killiecrankie Beach - Enjoy fossicking for your own Killiecrankie "diamonds". Topaz that can be found in the creeks and the bay and can be found as close as along the foreshore. Take a dip in the ocean and grab a crayfish when the fishing boats come in for the day. 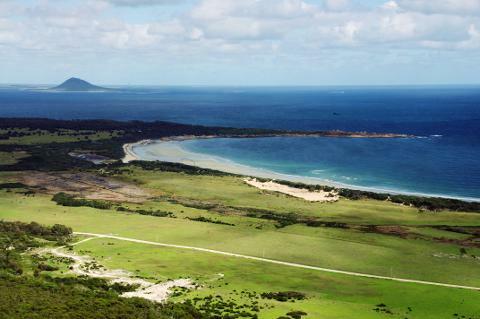 Trousers Point Walk - a walk that showcases Flinders Island's best coastal scenery. 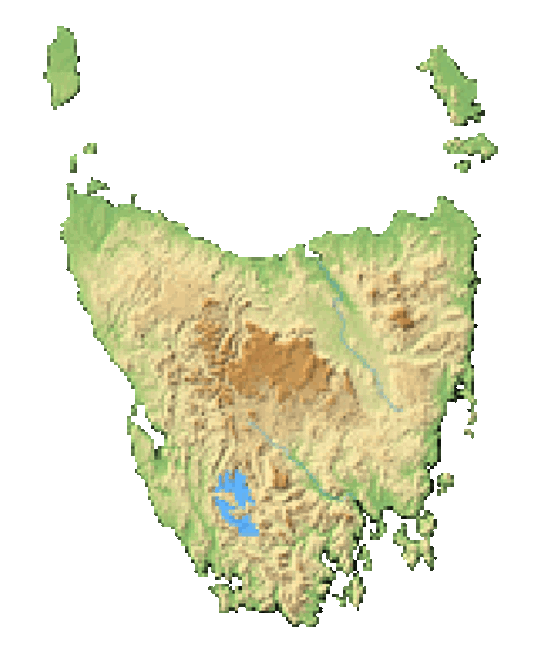 Flinders Island is the largest island of the 52 that make up the Furneaux Group. Located off the northeast coast of mainland Tasmania, this is the ultimate escape into the great outdoors and epitomizes the wild and rugged beauty of the region. It has a total land area of 1,333 square kilometers (515 sq mi) and the highest peak is Mount Strzelecki at 756 metres (2,480 ft). A trip to Flinders Island is sure to dazzle your eyes with breathtaking views and stunning landscape, while keeping you in awe of the array of wildlife and flora. Mouth-watering treats are around every corner and your stomach will not go unattended. This remote getaway is a wonderful opportunity to commune with nature. Begin the day with a fishing expedition and end it with a beautiful walk on one of the secluded beaches. Consider a round of golf or take a drive to explore the wilderness. Cars can be hired if you did not ferry your vehicle in and are recommended as there is no public transport on the island. For a bit more action, take a dive or even consider fossicking for 'Killiecrankie diamonds'! 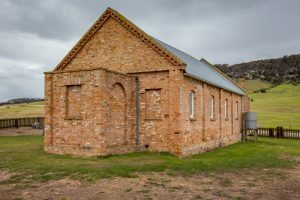 For history buffs, the Furneaux Museum is the perfect way to pass the time and learn about the region’s fascinating history of shipwrecks and settlement. There is also a strong focus on cultural and natural history and the museum complex features many buildings that are historic in themselves. Take in the sights and sounds of the local wildlife and ecology with a long trek or take a bike ride if you freighted it in. Simply enjoy getting away from it all! 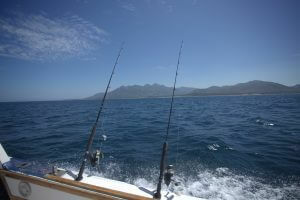 Image thanks to: Tourism Australia & Graham Freeman - Fishing trip. Although the island was inhabited by Tasmanian Aboriginals at least 35,000 years ago, about 4,500 years ago the population either departed or fell ill, leaving the island desolate for thousands of years. In 1773 British navigator Tobias Furneaux recorded some of the islands in the region and thus reignited human interest. Navigator Matthew Flinders charted the region 5 years later and soon a vibrant export industry for sealskins and oil developed, bringing European sealers who settled on the island. The settlers who remained on the island even after the sealing industry began its decline became known as the Straitsman. In 1830, many Aboriginals were exiled to Flinders in an attempt to ensure their survival. Although it was largely unsuccessful and led to many deaths from influenza and pneumonia, 16% of the population to this day is composed of Tasmanian Aboriginals. Visitors can still visit the restored Wybalenna Chapel from the attempted settlement. Settlers came during 2 key periods in the 20th century: just before WWI and after WWII as part of a Soldier Land Settlement Scheme. Both of these periods impacted the island by increasing population and trade. Today, the population of around 800 is mainly engaged in primary industry with large exports of fat cattle, lambs, crayfish, wool, abalone, shark and scallops. Image thanks to: Dietmar Kahles - Wybalenna Chapel. A trip to Flinders would not be complete without enjoying the local specialties. Fresh seafood such as abalone and the Southern Rock Lobster (crayfish) are must-trys. 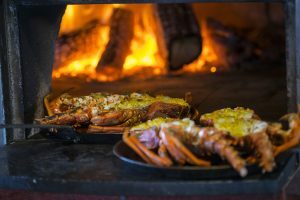 Plenty of meats such as lamb, beef, and even wallaby are available! The produce is also second to none. Seasonal fruits and vegetables round out a perfect meal and can be enjoyed with a wine from a local boutique winery. 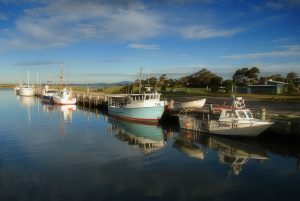 Image thanks to: Tourism Tasmania & Rob Burnett - Crayfish. Visitors can opt to rough it in the wilderness and stay on camping grounds or in cabins to get away from it all. For something more comfortable, B&Bs, holiday cottages, or farm stays may be preferable. Last but not least, hotels or a seaside resort may be the way to go. Either way, there are several styles and options available to suit several types of getaways. This remote island is a feast for the eyes with woodland mountainous regions juxtaposed with sandy coastal areas covered in scrub. The variety of plant species highlight this region as a land of great biodiversity. In fact, there are over 800 species that exist in the Furneaux Group of islands. Several native bird species are present including the Cape Barren goose and the short-tailed shearwater. Several varieties of possum, along with wallabies, feral turkeys, and Tasmanian pademelons inhabit the island. Strzelecki National Park can be found in the southwest.